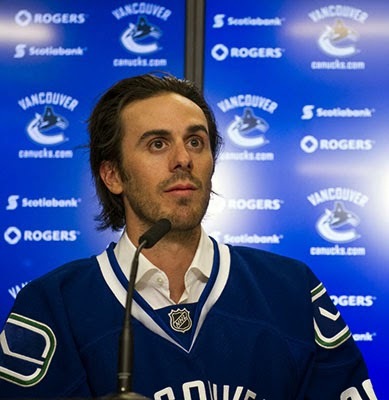 The Sin Bin Sports Blog: Is Ryan Miller Ready For Vancouver? Miller opened last season with the Buffalo Sabres, and sat in the league's basement for much of the season, until he was traded to the St. Louis Blues in late February. Miller's play was off and on with both teams last season. When he was with Buffalo he was playing with a bottom tier team in front of him. While with the Sabres Miller faced 1,351 shots, and allowed 108 goals in 40-games played. He faced 40 or more shots in ten of those 40 games, and eclipsed the 50 shots faced mark twice. All of those are numbers that suggests that a goalie is going out on a nightly basis and working his hardest, even if there is a mediocre team in front of him. The fans in Buffalo knew this. They did not blame Miller for many of the teams loses. They wouldn't get on his case for a soft goal. The fans understood. It was much of the same in St. Louis. Miller went out and played his hardest, but this time for a much better team. The Blues were a playoff team, but seemed to be missing that last piece of the puzzle; an elite goaltender. Miller was welcomed with open arms by the Blues. He went 7-0-1 in his first eight games and grabbed a 1.62 goals against average in those games. But things spiraled out of control for Miller and the Blues as the regular season came to an end with Miller going 3-8-0 in the team's final 11-games. The post season wasn't much better for the Blues' savior, who went 2-4-0 and allowed 21-goals against in the Blues' first round exit. But once again, Miller was not pushed into the fire as the scapegoat. Those watching understood that it was team collapse that pushed the Blues out of the division lead and ultimately out of the playoffs. Now with Miller in Vancouver he may have to brace himself for his first true test when it comes to a fan base. Canucks fans are a ruthless bunch and not the productive ruthless like tormenting other teams on game night. I mean they will throw a player under the bus the second things start going south. Seriously, they can't make up their minds. I have always been a big fan of Miller. Now with him playing for the Canucks things will be a little hard for me to want him to succeed in any way, but I hope the fans treat him better than they have treated the goalies of Canucks past. Currently, one in every 20 Americans, or about 6%, own a Rolex replica watches or fitness tracker, Mintel said. Male watch enthusiasts represent the biggest area of opportunity for the industry, since 37% of men aged 18-to-34 who have purchased a traditional watch in the past 12 months said they would be "very interested" in also purchasing a smartwatch or fitness tracker within the next year, the study found. Whether he is ready for such an event in his life, only he and his tener can answer, because only they know its possibilities.